Main | Articles | Is there a second life for solar panels? Is there a second life for solar panels? In recent years, there has been an active development of solar energy throughout the world. This trend is accompanied with a real desire to use natural renewable energy sources for the benefit of countries` population, but without causing damage to the environment. Unlike heavy industry, solar energy is a fairly young industry that has not yet managed to “contaminate”. However, each product and material has its own life and use. What is the fate of the PV-modules, which have reached the deadline of their consumption service? Solar modules which have played out themselves (on average, the lifetime of the first PV-modules is 25-30 years), belong to the category of electronic waste (e-waste). According to preliminary estimates, the annual global volume of e-waste in 2018 was 50 million metric tons. Each year, the share of solar energy in the world market is increasing: plus 18% by 2019 and commissioning of about 123 GW, according to IHS Markit’s calculations, therefore, the issue of the further utilization of already used PV panels is very acute. The International Renewable Energy Agency (IRENA) and the International Energy Agency (IEA) in 2016 published a joint report on the strategy for the utilization of solar modules. 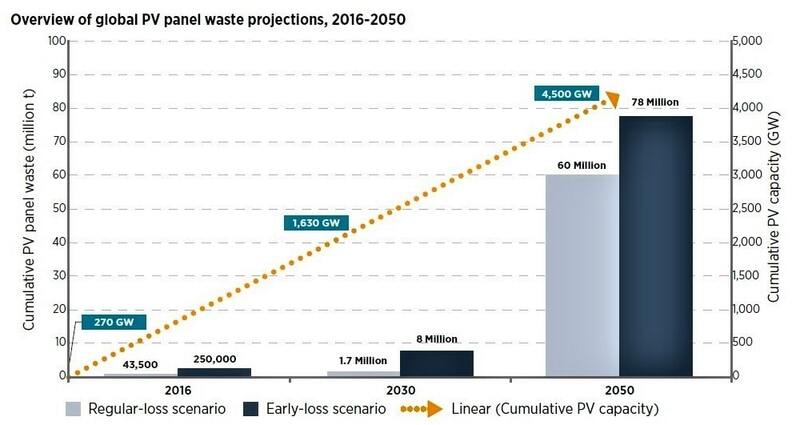 It is projected that by 2030 world waste of photovoltaic (accumulated) will amount to 1.7-8 million tons, depending on whether it will be regular loss (modules that have worked their lifetime in 25-30 years) or early loss ( prematurely removed modules, before the expiration of their service life for a number of reasons – replacement of obsolete equipment, mechanical damage to panels, etc.). 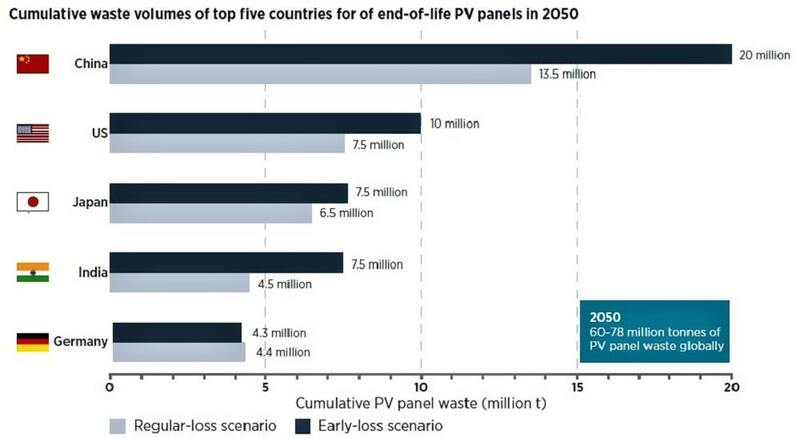 Already by 2050, the volume of waste PV-modules, which served their term, will be 60-78 million tons (Fig. 1 and Fig. 2). If the amount of waste PV-modules with a lifetime service up to 2030 is converted into cash equivalent, by recycling and extraction of materials, then the amount will be about $ 450 million. In turn, this amount of waste can produce 60 million new panels, which is 18 GW. And by 2050 this figure will increase to $ 15 billion a year! Of this amount of waste, it will be possible to make 2 billion PV panels, which is equivalent to 630 GW (Fig. 3). On the example of the world’s leaders in solar energy, let`s consider which steps have been made to utilize and reprocess the used photoelectric panels, both common and know-how, in particular. China, the USA, Japan, EU countries are actively investing in research and development on the processing of solar panels. Today, there are two types of processing PV-modules – thick and thin (see infographics). The first one is the extraction of the main materials of the module – aluminum, copper, glass, but plastic is simply burned. With fine processing it is possible to remove all chemical elements. The solar modules include raw materials that can be reused. Thus, in a percentage ratio, the crystalline silicon panel is 76% glass, 10% polymeric materials, 8% aluminum, 5% silicon semiconductors, 1% copper, less than 0.1% silver, tin and lead. The basis of thin film modules is 89% (CIGS) and 97% (CdTe) glass. The processing of solar module waste is regulated at the legislative level. For example, China does not have a specially developed law yet, but it does not prevent the country from recycling. In India, PV-waste is regulated by the Ministry of the Environment, forests and climate change in accordance with the Hazardous Waste Regulations, as well as the management and transboundary movement. In Japan, however, used PV-panels fall under the general waste management laws. There are also recommendations for dealing with solar panels after the expiration of their service. In the processing of e-waste, suceeded such countries, as: the United States and EU. On the example of the USA, Germany and France we will consider typical and non-standard solutions in this issue. In the United States, utilization of panels is governed by the Law on Resource Conservation and Recovery. There is a program for voluntary panel salvaging. Also, it should be taken into account that each state can operate its own local laws. Americans have developed the technology for processing thin film CdTe-modules in the 2000s. For the first time it was applied by the photovoltaic company First Solar. 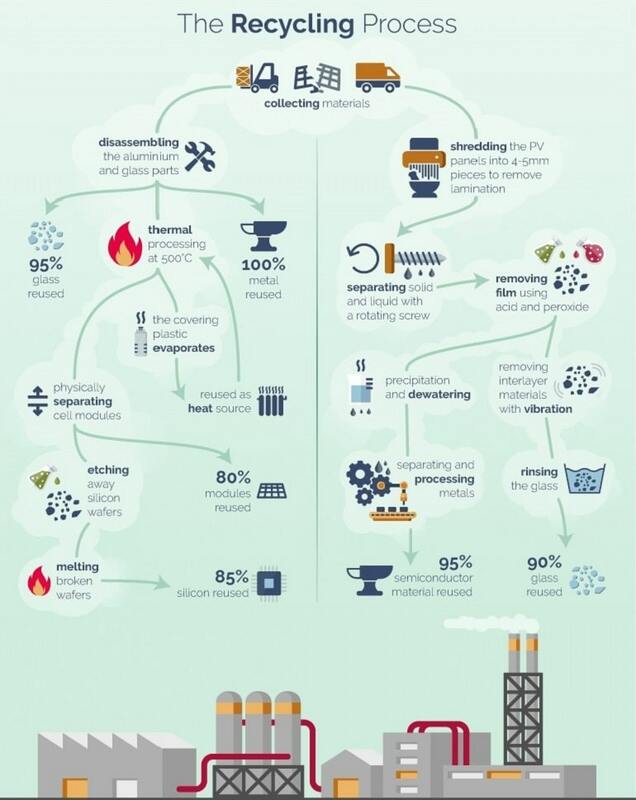 Thanks to the developed technology, 95% of semiconductor materials and 90% of glass can be reused. All dismantled elements of PV-modules are processed in a single cycle. EnergyBin is a web platform for the search and sale of solar panels for their further purchase or resale. The platform is designed exclusively for solar energy companies. The 3500 EnergyBin members consist of sunspot installers, developers, distributors, manufacturers, managers of operation and service of both small and large enterprises. There is an application process and an entry into the EnergyBin community. Participants can search the market for products and receive offers from several distributors at a time to compare prices. EnergyBin is not only resale, useful meetings and contacts. You can always find spare parts for long-standing equipment. When the panel reaches the expiration date it does not mean that it can not generate energy. Despite the reduction in efficiency, the used panels can be installed on volunteer projects, as confirmed by WFTSS. The founder of WFTSS, Vincent Latham Sr., said that they had previously stored more than 100 tons of solar material in landfills. They sold redesigned panels for solar manufacturers and companies that were looking for spare parts for existing arrays. 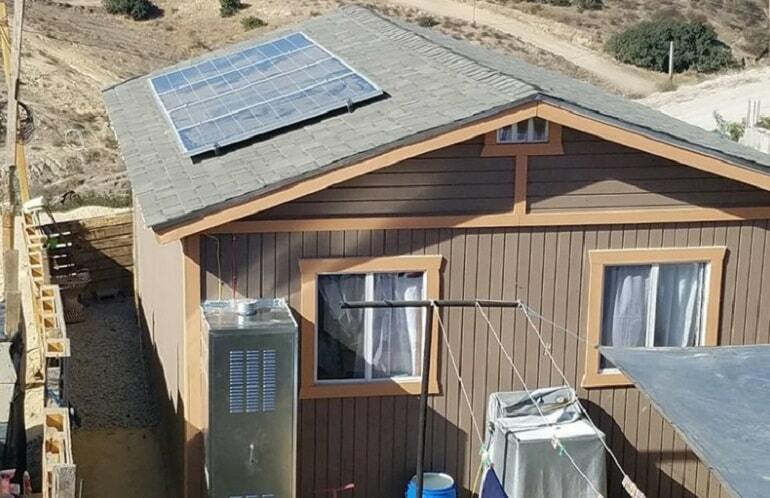 By selling reusable panels and turning out large-scale arrays, WFTSS can fund its main mission to provide free solar projects to the natives in Mexico. The WFTSS is working with a volunteer organization that builds homes in about 20 countries for people in need, including Mexico. In general, WFTSS redesigns, recycles, and grants PV-modules for charity. In the United States there are companies that offer solar conversion and re-use services. First, panels are evaluated, then repaired. Since these modules are repaired, they are sold at a lower price compared to new panels (from 0.05 to 0.15 US dollars per watt). The utilization management of solar power plants in the European Union is regulated by the WEEE Directive (2012/19 / EU). Producers are required to finance the processing of solar modules sold in Europe. The law requires the recycling of 80% of waste annually (fig. 4). The Germans succeeded in the process of recycling PV-modules, which, along with North Americans, were pioneers in this field. In Germany, the same processing technology for thin-film CdTe-modules, as in the US, is common, that is, the processing of all elements of PV-modules in a single cycle. The technology is well established – the process of recycling PV-modules has become more environmentally friendly and less energy-efficient than the production of primary raw materials for photovoltaic panels. The EU invests greatly in solar panel utilization projects. One of such projects is ELSi, which is operated by the German company Geltz Umwelt-Technologie. 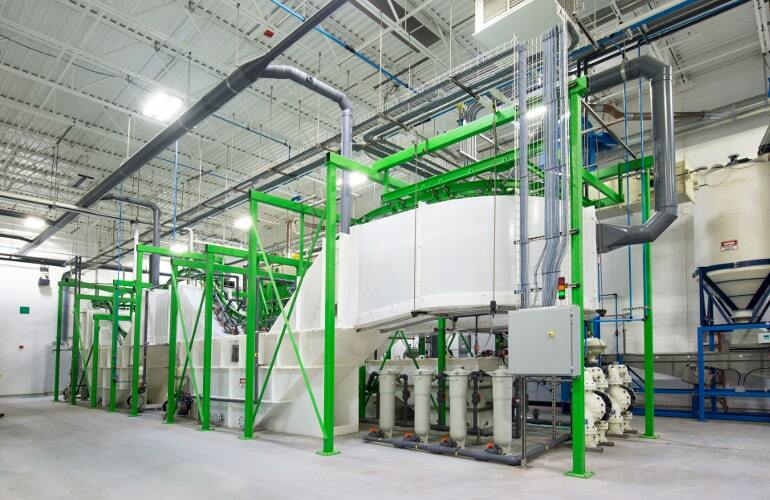 The essence of their processing technology is the reusage of materials (which is about 95%), extracted from PV-modules. Productivity of the enterprise – 50 thousand PV-modules per year. In 2018, the French company Veolia caused a furor by opening a plant for recycling PV-modules. Previously, in France, used or broken solar panels were simply redesigned by installations for the recycling of general purpose glass. With such a process, it was possible to remove glass and aluminum frames, everything else was burned. Now, at the new Veolia plant, they disassemble PV panels for the removal of glass, silicon, plastics, copper and silver. These elements are then pelletized and supplied as ready-made raw materials for the production of new solar panels. In case of asking, if there is a second life in the solar panels, you can safely answer “YES”! From an economic point of view, the issue of the profitability of processing PV-modules remains relevant. Numerous studies have shown that the cost of a scrap of a photovoltaic power plant (mainly steel and copper) exceeds the cost of decommissioning, so recycling of waste is more profitable than their burial. One can safely say about a direct proportional dependence: the more waste (at least 20,000 tons per year), the higher and more profitable the process of recycling. If we talk about the environmental side of the recycled spending PV-modules, then there will definitely be a big and bold “plus”: just imagine if the projected amount of waste PV-modules by 2050 (60-78 million tons) is simply thrown into the trash … As today produced solar cells contain toxic substances, they will be harmful to the environment. And, of course, the charitable aspect can not be bypassed. The American company WFTSS in practice has shown how their working life of the solar panels can continue to be used in the private sector for the needs of the poor. The second life of PV modules to be definately!